Grocery Prices - Adventures In ComparisonsEliminate The Muda! 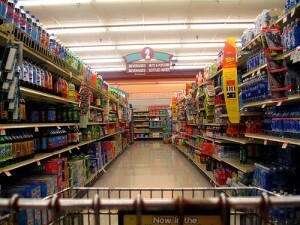 Costs of groceries were one of the inspirations that drove me to launch this blog. We have some friends, a couple with 5 kids living on a single income and eating on less than $700/month. We are not there! Yet! Then I ran across W. Hoddington Carter’s Extreme Frugality blog, a family of 6 living on $550/month. We are definitely not there. Another blog post from Wear&Tear prompted the thought of using a Dollar General as a place to save. While most of our efforts to pare costs have been focused on insurances, transportation, eating out and eliminating the frivolous we have largely ignored the costs of groceries, until this weekend. We chose not to blindly follow the generic advice. Generally we do most grocery shopping at the local Publix and Kroger stores. This week our plan was to explore other options like Costco, Super Target and even a Dollar General. We just wanted to get a rough idea of what we were facing. The best deal at Dollar General and the reason I will likely return was Greeting Cards. Trips to Hallmark turn my stomach at $3-$5 for a card that is read for 30 seconds then thrown away! Dollar General has an admittedly smaller selection priced at $1.00 if marked $3.89 and up or 2 for $1.00 if marked at $2.99 or down. 3) Buying from the big box retailers (Costco in our case) is also not always the best deal. After shopping at Target, my wife knew for sure we would be able to buy my only vice, Dr. Pepper at Costco for considerably less. She was right soda is $.25 per can at Costco versus $.375 per can at Target. While there she figured we should go ahead and pick up Milk, Orange Juice and Paper Plates in bulk. 4) Buying with coupons – When properly used it’s hard to see how this cannot always be beneficial. When used improperly they are simply another way to separate you from your money. Follow a strict rule of only purchasing what you need, if a coupon applies take advantage of it. 5) Buying generic brands is more about personal preference and an analysis of the cost (savings) and benefit. I grew up being a brand snob always wanting whatever the Jones had. With what little maturity I’ve developed I have come to realize that in many cases there is not enough difference between the name brand and generic products. In other cases the quality of the no-name brand is significantly different. Nothing else tastes like Dr. Pepper to me. Mr. Pibb is an acceptable alternative if I must. Dr. Thunder is not! After of decade of routine travel I’ve learned to accept institutional toilet paper my wife has not. When it comes to generics there is significant potential savings though. For this reason alone we will continue to try the alternatives and where acceptable we will make the switch. Next week we plan to take all the prices we’ve captured this week for the routine products we purchase and visit Walmart and return to one and maybe the other local grocery store to complete our market comparison. Fundamentally we have realized there will be no one source for getting the best products or best prices. We have decided we will be developing a personal price list of common products that we will take on all future shopping trips. Our scientific wild a** guess (SWAG) indicates we should be able to cut our grocery expenses by at least 10% just by being price intelligent. It will take extra time and maybe a dozen additional store visits each year but the few hours we spend should result in saving several hundred dollars. Time well spent!